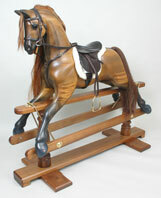 For rocking horse restoration by the UK's leading rocking horse restorers, please contact us. 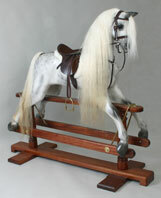 We can repair your old or antique rocking horse by providing a full structural repair and then fitting new accessories. We will select the most appropriate restorer for your particular rocking horse and provide you with 'before and after' photos of our restorations of similar rocking horses for other customers. 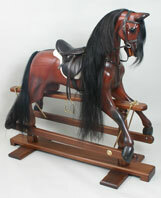 If you entrust your horse to us, you are entrusting it to the most skilful and experienced of rocking horse restorers. From our Birmingham base, we look after family treasures throughout the West Midlands and beyond, so if you need Birmingham rocking horse repair and West Midlands rocking horse restoration we will be pleased to help. 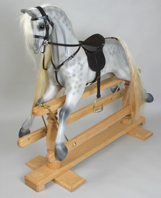 We do not supply accessories, such as rocking horse saddles, manes and tails, but we are part of the UK's pre-eminent group of professional rocking horse restorers.